In this article we explore the reasons behind the ongoing European crisis and scenarios about its future. Contrary to popular belief that increased lending, first in the financial and corporate sector and then on a country level, is the key source of Europe’s problems, it turns out that this may be just the tip of the iceberg in a series of many structural problems, namely: reduced global influence, low growth, population ageing, reduced competitiveness against developing countries, increasing energy dependency, and loose coordination among participating countries. Overall, Europe is quickly losing momentum in the global economy, as it becomes more and more “yesterday’s news”. However, the solution may exist in what we call the “large” Europe scenario. * This article is an adaptation of the original publication of the Forecasting Net blog (www.forecastingnet.com) for the GeoPolitica journal. Follow the link to download both the original and adapted versions. In this paper we use the assumption that global activity, as measured by real GDP, follows the well known s-curve function. Also, in order to model the relative power of specific regions, we use the Logistic Substitution method. Estimates from the derived models are tested against actual data and linked to real historical events where appropriate. According to the paper, the global economy follows a two-century growth wave, from 1917 to 2112, attributed to globalization. 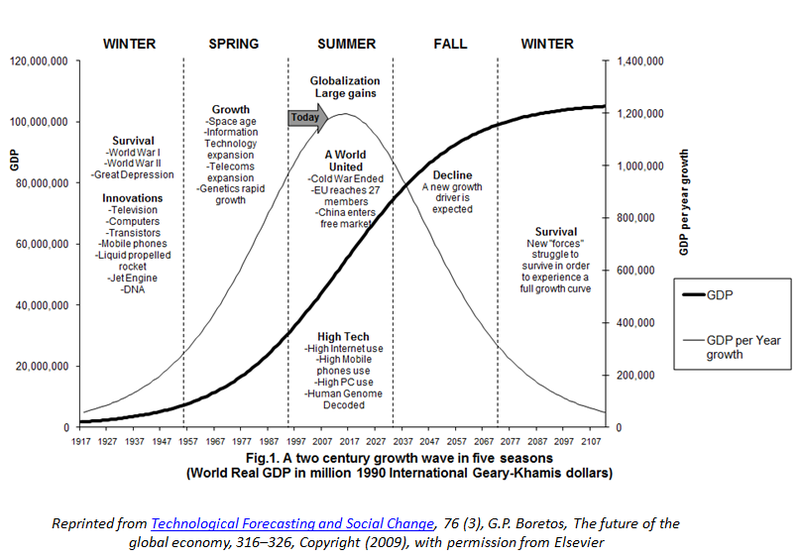 This period is equally divided into five phases called “seasons” that last nearly 40 years and constitute successive periods of growth, saturation, and decline. Almost every forty years, near the middle of each season, there is a peak point that initiates a cyclical slowdown of the global economy. The cyclical downtrend occurs when the economy “overshoots” i.e. when the ratio between actual and estimated GDP is at maximum. The first two cyclical slowdowns occurred in 1937, near the start of World War II and in 1975, near the outburst of the oil crisis. 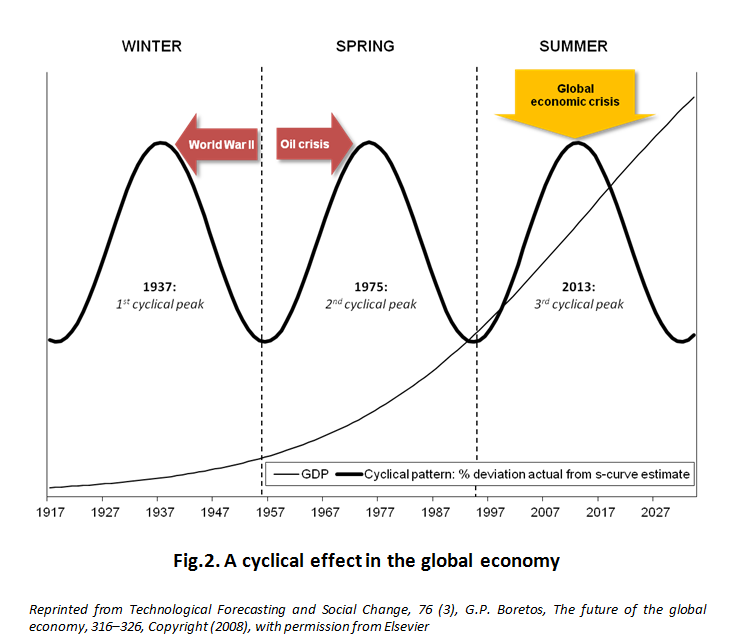 The next cyclical peak occurs in 2013, very close to the ongoing global economic crisis. Furthermore, the paper concludes that China's emergence as a superpower could have been predicted even as way back as 1985 by using the Logistic Substitution method. Although China will continue to grow, in terms of percentage contribution to global GDP, by the year 2024 it is expected to enter a substitution phase, as our world will most likely experience the emergence of a new “superpower” that will take its place, and once more will change the international landscape as we know it today. In this article, published in Marketing Research Association’s Alert! magazine, Roger’s Diffusion of Innovations Model, based on a simple s-curve, is explored as well as its numerous applications in marketing, business, and the economy. A case study of application to the global economy is offered as a proof of concept of the famous model. "Global Recession: Just a Glitch or Is It Here to Stay?" The recent credit crunch of 2008 ignited in 2009 one of the most severe economic slowdowns since the World War II. Even though there is a consensus that we have entered a serious global economic recession that will probably change the balance of power between emerging countries and Western economies, there are still many unanswered questions. What triggered the recession and what is its true nature? What are the similarities between the current recession and the Great Depression? Has the long-term growth trend of the global economy been compromised or is this recession a cyclical phenomenon? At what extent will it affect the balance of international powers? And the most important question of all: is it a random or a systematic phenomenon that we could have predicted? If so, what can we do now to minimize losses? In this book chapter, we shed some light on these questions based mainly on a recent study concerning the future of the global economy, published just a few days prior to the collapse of Lehman Brothers in September 2008 that signalled the beginning of the credit crisis. Furthermore, by combining data from this study and other sources, we provide the reader with both qualitative and quantitative insights about the current recession. In this paper, a general model of Interaction Systems (IS) is introduced that can be applied to many different fields covering economic, business, social, physical, and other phenomena giving us both numerical estimates and qualitative insights of the system's dynamics. This is illustrated in two case studies. First, the IS model is applied to the global economy. The resulting model is tested against real global GDP data. The new IS model gave reliable estimates and presented a basic framework of understanding the nature of major economic shifts, including the recent global recession of 2009, by studying the dynamic relationship between demand and supply. In the other case, the IS model is applied to elementary chemical reactions in order to quantify the reaction kinetics. The result is the well known rate law of chemical reaction kinetics thus providing evidence of the proposed model's validity. "The Suitability of S-curves in Forecasting the Mobile Phone Market"
In this book chapter, we test the suitability of s-curves in forecasting the mobile market. In order to do so we compare (a) forecasts made for China’s mobile subscriptions with data up to 2001, with actual data for years up to 2006 and (b) forecasts made for World’s mobile subscriptions with data up to 2004, with actual data for years up to 2006. China’s projections with limited data up to year 2001 gave relatively accurate estimates of mobile subscriptions with less than 8% error for 2006.In the case of World mobile subscriptions, the emergence of a second growth wave after the completion of a first one is confirmed, thus leading to a new estimate of approximately 3.5 billion subscriptions (the impact of 3G connectivity after 2007, not captured in this analysis, actually led to an even greater number of subscriptions near 4.5 billion at 2010). In this article we use the assumption that the diffusion of mobile technology, as measured by the number of active mobile accounts, follows the well known S-curve of natural growth in competition systems. The accuracy of the logistic fit is tested against actual data for the whole World, Europe, China and the GSM system. Using the produced models we make predictions about the future of the mobile business. In this paper, we explore the potential for the creation of forecasting “on the go” applications for smartphones and tablets. Further from mere convenience, these applications may streamline approaches to collaboration between retailers and suppliers, thus contributing to the provision and exchange of product information as well. In this book chapter, a product of a multicultural research project, we provide an understanding of users from different countries and principles that support better design of user experience (UX) in the context of mobile advertising.